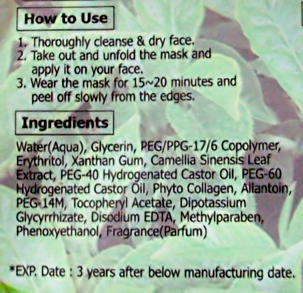 Purederm Green Tea Collagen Mask is originally from Korea. Watson has so many Korean mask which is pretty good. and the result is really good. I'll give the other mask review too next time. Sorry it's in Bahasa, the english version is below. ☆ My Skin become brighter and supple. ☆ My pore look more smaller. ☆ Moist my tired skin. ☆ Contain green tea and collagen. Purchase again? YES! I'm going to stock it monthly. I got it @ Watson for about $2. ituh essence nya banyak gak? sebanyak essence nya MBD mask punya gak?? i think when my mum goes back to Hong Kong I will ask her to get me alot of things XD and i love things that smell like green tea :3 I love it :3 and nice revieww and thanks for the link!